Peabody Square on Blackfriars Road, Southwark, is a typical example of an early Peabody estate, and of pre-World War I social housing in London in general. Peabody Trust housing on Marshalsea Road in Southwark. The Peabody Trust was founded in 1862 as the Peabody Donation Fund and now brands itself simply as Peabody.. It is one of London's oldest and largest housing associations with around 55,000 properties across London and the South East. It is also a community benefit society and urban regeneration agency, a developer with a focus on regeneration, and a provider of an extensive range of community programmes. The Peabody Trust estate in Horseferry Road. 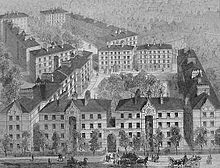 The Trust was founded in 1862 by London-based American banker George Peabody, who in the 1850s had developed a great affection for London, and determined to make a charitable gift to benefit it. His initial ideas included a system of drinking fountains (comparable to the Metropolitan Drinking Fountain and Cattle Trough Association scheme actually set up by Samuel Gurney and Edward Thomas Wakefield in 1859), or a contribution to the "ragged schools" of the Earl of Shaftesbury. In March 1859, however, he settled on establishing a model dwellings company. Three years later, in a letter to The Times on 26 March 1862, he launched the Peabody Donation Fund, with an initial gift of £150,000. The aim of the organisation, he said, would be to "ameliorate the condition of the poor and needy of this great metropolis, and to promote their comfort and happiness". The paper reported, "We have today to announce an act of beneficence unexampled in its largeness and in the time and manner of the gift". Shortly before his death in 1869, Peabody increased his gift to £500,000. The Peabody Trust was later constituted by Act of Parliament, stipulating its objectives to work solely within London for the relief of poverty. This was to be expressed through the provision of model dwellings for the capital's poor. The first block of Peabody dwellings in Commercial Street, Spitalfields. A wood-engraving published in the Illustrated London News in 1863, shortly before the building opened. The first block, designed by H.A. Darbishire in a red-brick Jacobethan style, opened in Commercial Street, Spitalfields, on 29 February 1864. It cost £22,000 to build, and contained 57 "dwellings" (i.e. flats) for the poor, nine shops with accommodation for the shopkeepers, and baths and laundry facilities on the upper floor. Water-closets were grouped in pairs by the staircases, with one shared between every two flats. This first block was followed by larger estates in Islington, Poplar, Shadwell, Chelsea, Westminster, Bermondsey, and elsewhere. By 1882 the Trust housed more than 14,600 people in 3,500 dwellings. By 1939 it owned more than 8,000 dwellings. In its early days, the Trust imposed strict rules to ensure that its tenants were of good moral character. Rents were to be paid weekly and punctually; there was a night-time curfew and a set of moral standards to be adhered to; and the dwellings could not be used for certain trades. Peabody is leading a £1 billion regeneration of Thamesmead, Abbey Wood and Plumstead in South-East London. The Group worked with the Royal Borough of Greenwich and the London Borough of Bexley to successfully bid for Greater London Authority housing zone status, which led to a c£80 million investment. As well as providing thousands of new homes in the area, Peabody says it will provide firm foundations for Thamesmead’s long term, sustainable rejuvenation by investing in existing homes, infrastructure and services to improve the quality of life for existing residents. Going beyond "bricks and mortar", Peabody says its work with partners will enhance employment, enterprise, cultural, social and leisure opportunities for people which is supported by socio-economic outputs. locally. Thamesmead and the surrounding area is a major growth and opportunity area for London. Crossrail will open at nearby Abbey Wood from 2019, and Peabody has said it will capitalise on this, ensuring the right amenities, infrastructure and transport connections are available for the long term sustainability of the area. In 2014 Gallions, Trust Thamesmead and Tilfen Land became part of the Peabody Group. The Peabody Group now comprises two housing associations, Peabody and Gallions, and a number of trading companies.. In July 2017 Peabody merged with Family Mosaic housing association under the "Peabody" name. Housing associations borrow money to pay for new homes and improvements. In March 2011, Peabody raised £200 million on a corporate bond, at a rate among the best secured by a housing association borrowing in its own name. In 2013 it issued a public bond for £350 million. Family Mosaic is a housing association in the United Kingdom. It has over 25,000 homes housing over 45,000 people and is one of the largest housing providers in London, Essex and the South East of England. Family Mosaic also provide care and support services to over 8,000 people. Family Mosaic works with young people, helping them into work  and promoting better health to young people. In addition to offering specialist housing for people with support needs and social housing for general needs tenants, a third strand of Family Mosaic is its role in assisting people to get onto the property ladder through leasehold shared ownership properties. In April 2017, Family Mosaic announced that it would be launching a 111 home development for private rental tenants. Family Mosaic also runs employment training courses and activity groups for its residents. It also offers welfare benefits advice. Family Mosaic is a member of the G15 group of housing associations in London. In July 2017 Family Mosaic merged with Peabody Trust housing association under the "Peabody" name. Charlton Triangle Homes – Owns and manages 1,162 homes in the London Borough of Greenwich. Old Oak Housing Association – Owns and manages 669 homes in the London Borough of Hammersmith and Fulham. In 2012, Family Mosaic was paid an out of court settlement by Haringey London Borough Council because of the council's failure to pay additional costs of over £108,000 for two care home residents. A number of complaints have been made against Family Mosaic in the national and local press, including heating being cut-off for five months of the year, a ceiling collapsing, poor administration at one of its care homes, and a rodent infestation. In 2014, Family Mosaic took the unusual step of apologising to its tenants after a malfunctioning computer system led to an increase in complaints about its repairs service. ^ a b Peabody report and financial statements 2009 Archived 2011-07-21 at the Wayback Machine, Peabody, UK. ^ "Unprecedented Munificence" and untitled leader article, The Times, 26 Mar. 1862, p. 9. ^ "News story, Peabody website". Archived from the original on 2011-01-25. Retrieved 2010-05-19. ^ Bezodis, P.A. ; Ison, W. (1957). "Commercial Street". Spitalfields and Mile End New Town. Survey of London. 27. London: London County Council. pp. 256–64. ^ "Mr. Peabody's Gift", The Times, 1 Feb. 1864, p. 5. ^ Illustrated London News (1863). ^ The block was sold by the Trust in the late 1970s, being considerably smaller than most of the later estates and outdated in its facilities. However, it still stands, and is now a private residential block named The Cloisters. ^ "Peabody housing association - About us - London - Peabody". Peabody. ^ "Peabody housing association London - Peabody". Peabody. ^ "Thamesmead - Peabody - News, events & plans - Peabody". Peabody. ^ a b Tom Knowles (4 July 2017). "Peabody Trust merges with Family Mosaic in £6 billion deal". The Times. Times Newspapers. Retrieved 21 September 2017. ^ Peabody issues £200m bond, Inside Housing, UK, 11 March 2011. ^ "Inside Housing magazine - Peabody strikes £350m bond deal". Archived from the original on 2017-01-13. Retrieved 2017-01-23. ^ http://www.familymosaic.co.uk/our-business/index.html. "Our business – Family Mosaic". Retrieved 30 July 2016. ^ Imrie, Rob; Lees, Loretta (24 September 2014). Sustainable London? : The future of a global city. Policy Press. pp. 157–. ISBN 978-1-4473-1060-0. ^ "EIB lines up a further £580m in association loans – News – Inside Housing". Archived from the original on 10 June 2016. Retrieved 30 July 2016. ^ a b http://www.familymosaic.co.uk/about-us/index.html. "About us – Family Mosaic". Retrieved 30 July 2016. ^ http://www.familymosaic.co.uk/care-and-support-services/index.html. "Care and Support Services – Family Mosaic". Retrieved 30 July 2016. ^ "BBC NEWS - UK - England - London - Young people construct own homes". Retrieved 29 April 2017. ^ "BBC - Young parents make DVD to highlight danger of chlamydia". Retrieved 29 April 2017. ^ "London association to launch PRS vehicle with 111-home scheme - News - Inside Housing". Retrieved 29 April 2017. ^ Great Britain: Parliament: House of Commons: Communities and Local Government Committee (23 March 2010). Beyond decent homes: fourth report of session 2009-10, Vol. 2: Oral and written evidence. The Stationery Office. pp. 90–. ISBN 978-0-215-54497-1. ^ a b http://charltontriangle.org.uk/about-us/. "About us". Retrieved 30 July 2016. ^ "Family Mosaic wins care payout - News - Inside Housing". Retrieved 29 April 2017. ^ Lunn, Emma (3 October 2014). "Housing association residents 'cut off from heating five months of the year'". Retrieved 30 July 2016. ^ "'Ignored' Family Mosaic tenant hurt in ceiling collapse – BBC News". Retrieved 30 July 2016. ^ "Family Mosaic home criticised by Care Quality Commission – News – Inside Housing". Archived from the original on 2016-08-25. Retrieved 30 July 2016. ^ "Rat infestation causes misery for housing association tenants". Retrieved 30 July 2016. ^ Hopps, Kat (June 8, 2016). "Stratford families 'annoyed' with housing association employees for taking their parking bays". Newham Recorder. Retrieved July 30, 2016. ^ "'My whole flat smells like a dirty, wet towel because of damp' says mum". southwarknews.com. Southwark News. Retrieved August 18, 2016. ^ "Landlord apologises over repairs service - News - Inside Housing". Retrieved 29 April 2017. Parker, Franklin (1995). George Peabody: a biography (2nd ed.). Nashville & London. Lunn, Emma (October 3, 2014). "Housing association residents 'cut off from heating five months of the year'". The Guardian. Retrieved July 29, 2016. "'Ignored' Family Mosaic tenant hurt in ceiling collapse". BBC News. March 30, 2015. Retrieved July 29, 2016. Bartholomew, Emma (March 31, 2015). "Family Mosaic accused of 'breaching values'". Hackney Gazette. Retrieved July 29, 2016. McKay, Jessica (March 14, 2015). "Housing company makes support workers homeless". Hackney Post. Retrieved July 30, 2016. "Care company transfers contract after two years". Bexhill Observer. March 18, 2016. Retrieved July 30, 2016. Hopps, Kat (June 8, 2016). "Stratford families 'annoyed' with housing association employees for taking their parking bays". Newham Recorder. Retrieved July 30, 2016. Wikimedia Commons has media related to Peabody Trust. This page was last edited on 21 January 2019, at 16:09 (UTC).